Lawrence Livermore National Laboratory (LLNL) researchers have discovered an unusual new type of phase transformation in the transition metal zirconium. The mechanism underlying this new type of phase transition is the first of its kind that has ever been observed, and only could be seen with the application of very high pressures. The research was recently published by Physical Review B as a Rapid Communication. The team performed experiments utilizing a diamond anvil cell, which compressed the basic element zirconium to a pressure of more than 200 gigapascals (GPa), a bit more than half of the pressure found at the center of the Earth. 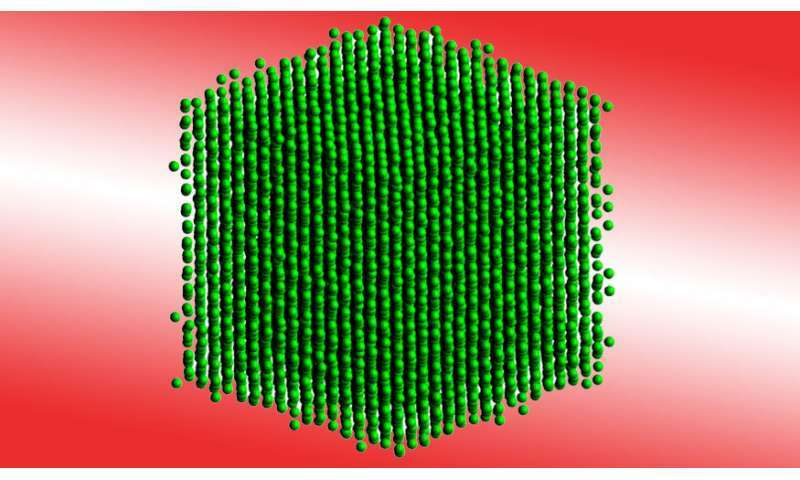 For several decades, it's been known that zirconium transforms into a body-centered cubic (bcc) lattice structure at pressures above 25 GPa. That's not the end of the story, however: Keep compressing zirconium beyond 58 GPa and it will undergo yet another phase transition, but, strangely, the atomic lattice will remain bcc. "Although simple systems, such as metallic elements, have been studied under static compression for more than five decades, there are still unexplored physical mechanisms involved in their structural behavior," said Elissaios Stavrou, a staff member in the Material Science Division at LLNL and lead author of the research. Having a first-order phase transition, with changes in both volume and enthalpy, yet remaining in the same lattice, is an odd type of phase transition that is referred to as "isostructural." Prior to this study, the only element on the periodic table that was known to undergo an isostructural transition was cerium. The phase transformation in cerium is driven by changes in the electronic structure that occur with compression. In zirconium, the isostructural transition isn't occurring due to electronic changes, but in how the atoms are vibrating. According to Stavrou, "first-order phase transitions under pressure are usually associated with either lower enthalpy structures or electronic transitions. In this work, we challenge this intuition and highlight that alternative mechanisms, such as anharmonicity, could trigger such phase transition even at room temperature." To help unravel the mechanism at play, quantum molecular dynamics simulations—very intense calculations that solve the Schrödinger equation of quantum mechanics in line with the motion of atoms on the picosecond timescale—revealed that the vibrational modes of the zirconium lattice undergo a sudden shift as its volume is reduced by the applied pressure, causing the phase transition to occur in a manner that is first-order. "First-principles simulations provide a complement to experimental discovery by means of precise control of the simulation conditions. In this case, we were able to trigger the lattice anharmonicity in our simulations and therefore provided a clarification of the mechanism that induces the phase transition discovered in these experiments," explained physicist Lin Yang, an expert in quantum molecular dynamics simulation. Yang points out that the simulations required to observe this mechanism are far beyond what researchers are typically able to probe. "In order to trigger the anharmonicity mechanism in the lattice dynamics, we had to run very long simulations. We are fortunate that LLNL houses the world's most powerful supercomputers that enable this scale of simulation," said Yang. Most intriguingly, this recent discovery highlights the possibility that there are other elements of the periodic table that also might possess an anharmonically driven isostructural phase transition like zirconium. "Zirconium has some interesting behavior, but in the grand scheme of things it's just another relatively simple transition metal. And yet, despite it's apparent simplicity, we are observing some rather complex emergent behavior at high pressure. Who's to say that other so-called simple metals might not also generate considerable complexity?," said Jon Belof, a group leader in the Material Science Division at LLNL and project lead for the R&D of phase transitions at high pressure. "Now that we know this mechanism exists, we know what to look for—the race is now on for the rest of the high pressure community to find these effects elsewhere on the periodic table."